This is an excerpt of a piece written by former NPR editor Jonathan Kern. It has been lightly edited. One of the under-appreciated challenges in putting a radio report together is ensuring that the story has a logical structure. All too often, reporters assemble their pieces by collecting their best tape, and then writing copy that moves from one tape cut to another (usually ending with the cut that is most poignant, or emphatic, or forward-looking, or in some other way sounds “conclusive.”) But a piece that is no more than a collection of good actualities strung together by the reporter’s voice tracks will be much less memorable than a story that unfolds in some systematic way. Exactly what way will depend on the story that’s being told. There was an old sow with three little pigs, and as she had not enough to keep them, she sent them out to seek their fortune. The first that went off met a man with a bundle of straw, and said to him, “Please, man, give me that straw to build me a house.” Which the man did, and the little pig built a house with it. REPORTER: In the end, it only took a blazing fire and a pot of water to eliminate the wolf that had terrorized the region’s wildlife the last few weeks and allegedly killed two little pigs. At the time of his death, the Big Bad Wolf was coming down the pig’s chimney, apparently intent on murder. The pig simply took the cover off the red-hot pot and trapped the careless predator. Police say the wolf boiled to death within minutes. REPORTER: Only one brick house is left standing in the woods that until recently was home to a thriving pig community. 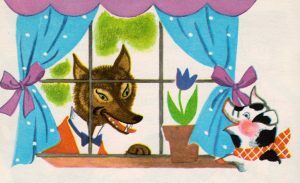 It was here – on the edge of the forest – that the Third Little Pig brought down the vicious wolf that had allegedly terrorized the neighborhood for weeks. REPORTER: Last Tuesday evening, the Third Little Pig was literally scared for his life. The Big Bad Wolf had killed two pigs already, and blown their houses to bits. He had set traps for the Third Little Pig… trying to lure him to Farmer Smith’s field, to the Merry Garden and to Shanklin Fair. The Third Little Pig had managed to elude him – but barely. His brick house was much more secure than the ramshackle stick and straw homes his brothers built. But now the wolf was coming down the chimney. The pig figured any attempt to escape was just postponing the inevitable. So he decided to face his fate – whatever it might be. One of the simplest ways to give a story a logical structure is to sketch out an outline (the first part of which is the intro). Do all of the elements relate to the focus of the story? Are there parts that are built around compelling tape but don’t actually fit with this particular story? Some NPR editors like to do “tape edits”; they listen to all of a reporter’s actualities before the script is written to make sure the tape cuts are in some sort of logical order. Taking the time to think and talk about structure – before the reporter starts writing – can actually be a way to save time during the edit.